The patented flame technology creates a truly realistic fireplace, giving the fire its depth and dancing flame that you will only find with Dimplex. 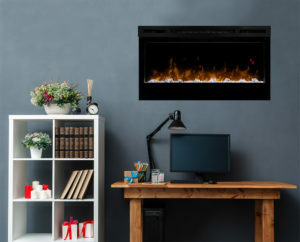 Give your fireplace a custom look with the Dimplex DF3033ST Self-Trimming 33″ Electric Firebox. This finely crafted 1000W firebox will make a good impression in any room while remaining low-maintenance. The patented, 3D LED flame effect creates the charm and intimacy of a real wood fire, but can be used year round with optional heat. The unit includes a temperature cut-off switch so it doesn’t get too hot, a sleep timer that will automatically shut off the unit, and a remote control for the user’s convenience. 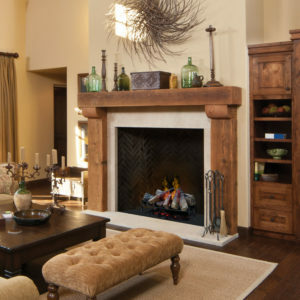 Once installed, simply plug the unit into a standard, 120V outlet and get ready to enjoy the ambience of a realistic fire.